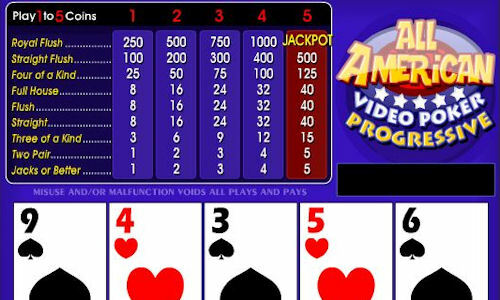 Video poker is actually a slot machine, one that you might have also seen in a brick-and-mortar casino. The slot machine is based on the classic 5-card poker game. Winnings are paid based on the value of the obtained winning combination of cards. The first slot machine models for video poker appeared as early as in the mid-seventies of the previous century, basically parallel to the production of the first personal computers. During the eighties, the popularity of video poker kept growing and it established itself as a staple in many casinos. The game is very popular especially in Las Vegas. There, casinos often offer even greater winning chances. Today we can also find video poker in online casinos. So a player doesn't need to visit a casino in person to play; he can enjoy the game from the comfort of his or her home. The game starts by setting the initial bet and the first draw of five cards. The player then has the opportunity to either get rid of all cards, or replace one or several cards. After the next draw, the machine evaluates the value of the cards "in the player's hand" and provides the corresponding win. Some versions offer progressive jackpots for Royal Flush or other rare combinations of cards.